I wonder how much of that FBI incompetence is actually subversive. Did anyone here heard something about a conspiracy theory that was called the Harvest? I read about it many years ago and it described a depopulation scenario that only a few % of the world population was destined to survive this harvest. Those few survivors were selected beforehand through very sophisticated DNA screening and chosen for an unknown reason. The rest of the population was going to be wiped out by an engineered virus that starts of as a harmless flu. Just thought you should know because they are still really obsessed with anything DNA related. Somehow all this talk about DNA reminded me of that story. Sounds like you are referring to the Hidden Hand thread. Never heard of it but thanks for the link. The story i'm refering to is quite old. 128/kbit to be exact. Everything is fake news with the MSM. They are just so ready to hurt Trump, they will print anything. Moffett Airfield is home to H211, LLC, owned by Google founders Larry Page and Sergey Brin. Through the LLC they pay $1.3 million a year to NASA to park their Boeing 767-200and Gulfstream V jets. Was that jetblue a gulfstream v? Maybe it isnt jetblue but google. I see it as a good sign that they have to resort to invent stuff because there is nothing there. No, they are having to issue on air corrections. They did not wiretap him and listen to his calls. Instead they have something called a pen register. 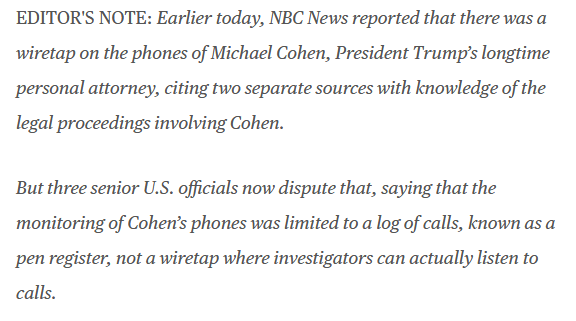 They were monitoring his calls, not a full wiretap. That's a big difference. So now the question is - did they or didn't they? Which is the lie? It's more Tyrion Lannisteresque catch the leaker maneuvers.